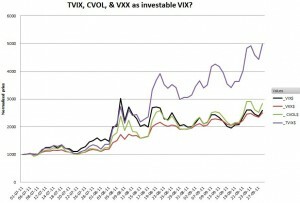 For a long time investors have been frustrated in their desire to directly invest in the VIX index. Now three ETNs, one by design, and the two other perhaps by accident are tracking (or out-performing) the VIX index on both a daily percentage move basis and for multi-day holding times. 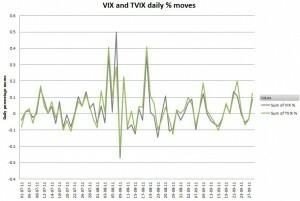 Historically the daily percentage moves of short term (1/2 month) volatility ETNs like VXX tend to be about 50% of the VIX index moves. 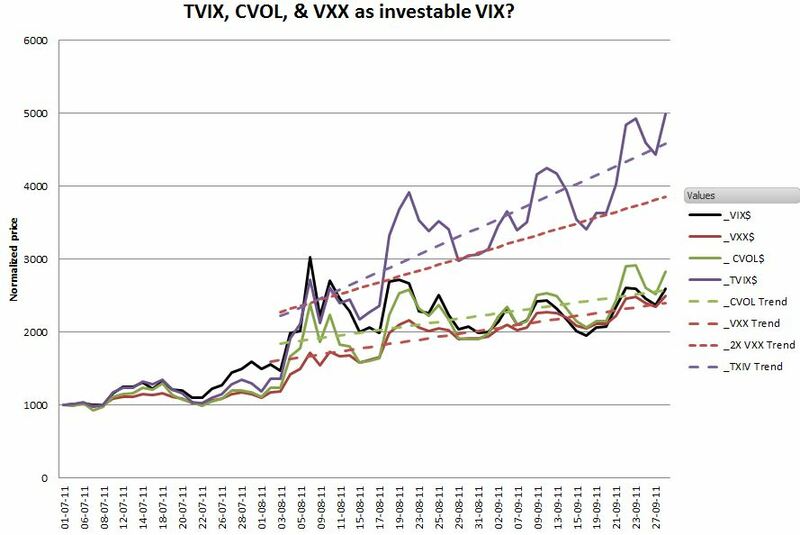 Since 2X VelocityShares’ TVIX and ProShares’ 1.5X UVXY are leveraged versions of VXX, you might expect them to track the VIX index—and they do a pretty good job except for the effects of contango/backwardation. 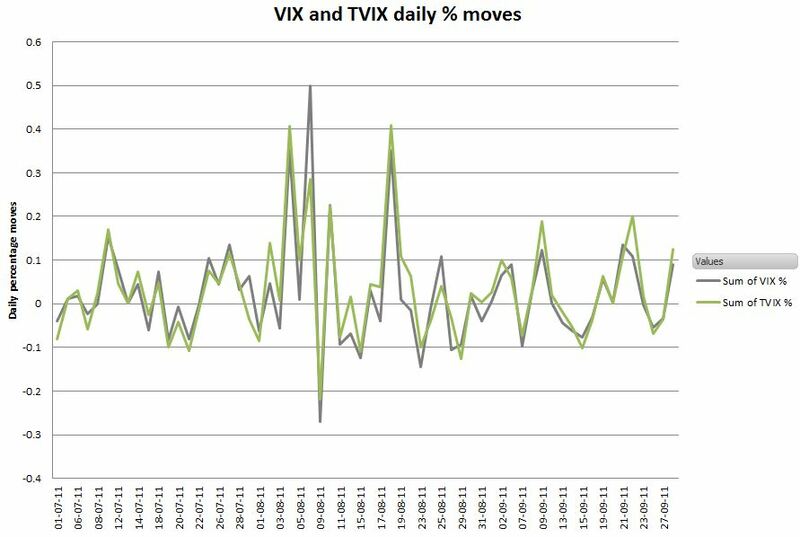 TVIX compared to VIX on a daily percentage move basis. While the daily percentage correlation is important, unless you’re day trading volatility (shudder) the more important attribute would be the results of holding these ETNs for a few days. In that case how well would they track to the VIX index? The chart below shows how $1000 invested in each of these starting July 1st,2011 would fare. 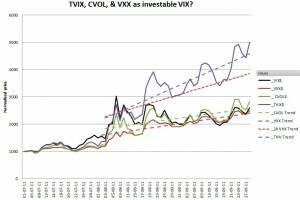 TVIX skyrocketed during this panicky time. A doubled benefit from backwardation was part of the gain, but the trend lines on the chart below suggests there are other factors. I suspect the rest is from the compounding effects of 2X leverage. 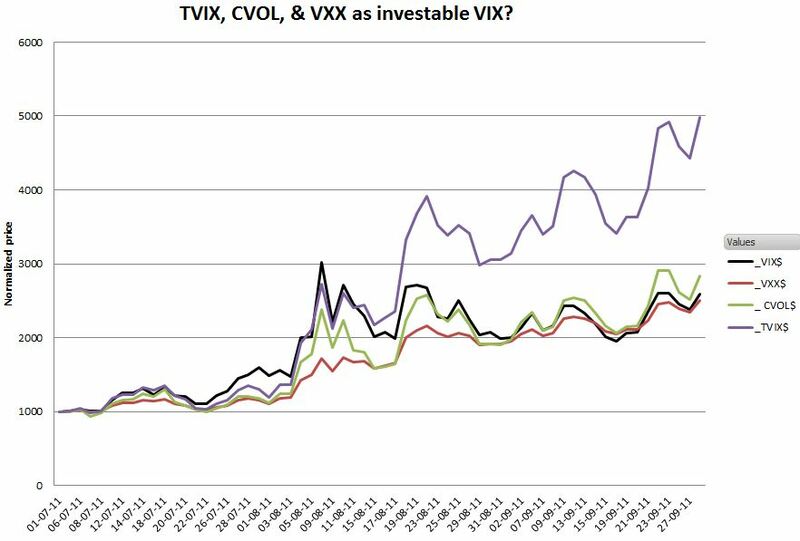 TVIX and UVXY look like the vehicle of choice if you want to bet on VIX’s moves during times of high volatility—it matches VIX’s daily moves well and greatly benefits from backwardation.